Chatham has the "distinction of being the only neighborhood in Chicago that developed from a European American middle-class community into one composed of middle-class African Americans." The shift happened in the 1950s when these middle-class African Americans were drawn to the area because of the strict zoning codes and property standards, high levels of community organization, and good schools. African American residency of Chatham was less than 1 percent in 1950, but by 1960 it jumped to over 63 percent. The racial transition, while rapid, was smooth compared to other parts of the city undergoing the same type of demographic change. For example, "several area churches welcomed blacks into their congregations, and the Chatham–Avalon Park Community Council began to include African American residents in their organization" in 1955. When the changeover was completed, African American residents worked "diligently to maintain the middle-class character of their community." 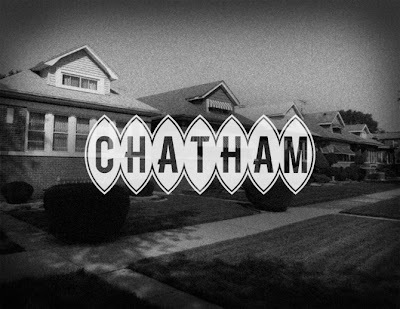 Because of this, Chatham continues to thrive, and the neighborhood has served as a home base for numerous successful black-owned businesses, including Johnson Products Company, the Independence Bank of Chicago, Seaway National Bank of Chicago, and a branch of the Illinois Service Federal Savings and Loan Association. There were comments that didn't like their logo for Englewood as it notes the serial killer H.H. Holmes and his building where he committed his crimes. Hopefully in the New Year many of you will like this entry for another one of our communities. BTW, I will again make a call for those of you with graphic design or artistic experience to create your own neighborhood logos. Hopefully your visions will show the positive aspects of our communities!